Learn proper meditation techniques and meditate in a group setting with a very experienced Zen monastic. Each of the two-hour sessions involves about 40 minutes of meditation (both seated and walking) and about an hour of discussion. Usually I provide some sort of starter issue for the discussion, but once underway, each session takes on a life of it's own. There is a break between segments with tea, coffee etc. provided. Emerging from our shared meditation, the ensuing conversation will tether our experience in the real world concerns of the participants. Questions, responses, various kinds of sharing; all conspire to generate a space rich with potential. This format is designed to accommodate busy schedules while allowing each person to develop a meaningful and useful meditation practice. What makes this opportunity even more exciting is the very real sense of bridging East and West. The chapel at Queenswood is a traditional Christian sacred space. Its peace and general ambience is familiar to any who have been raised in one of the traditional Christian observances. The labyrinth, of course, emerges from a more esoteric Christian tradition. There is an elegance to melding the two traditions in this way. Neither tradition is threatened by this juxaposition and indeed I think that a greater appreciation of the spiritual depths of our own tradition emerges. At least I certainly hope so and it is an important interest of mine to find ways to stand astride the two lineages; one leads to Jesus (or at least to Paul) and the other to Buddha. The two lineages might indeed clash at the theological level, but in practice they are rather more complimentary. It is practical, applied spirituality that interests me and perfumes my teaching and presentation. Where: Queenswood, 2494 Arbutus Road, Victoria. Cost: There will be no charge, but a donation is requested. Time: 9:00-11:00 and 1:00-3:00 most Sundays. It should be noted, though, that Queenswood closes a couple of times per year for a thorough cleaning. For this reason, interested persons should phone or write to confirm that the sessions are not interrupted by these periodic closures. As of this writing, for example, Queenswood is closed until September 12, 2004. All these sessions are drop in; no need to register. However, Wayne would appreciate some notice of intent to attend so that information can be passed to the kitchen, etc.. Contact: To obtain further information, please contact Wayne Codling at upaya@madhyama.ca. Or phone 598-9945. The primary benefit of a meditation practice is to help one establish and sustain a certain fidelity with one's own deepest desires. It is this sense of fidelity which permits some stress, which many people harbour, to dissipate. It is an article of faith that only the meditating mind is a venue vast enough to permit the fullest, most refined expression of you,: from deepest disappointments to deepest satisfaction. Those who might feel somewhat disoriented with respect to any aspect of their lives will hopefully find new potential for stability, security and control. This is the function of the Middle Way - it is the mind of many possibilities. There's an engaging irony at work here that I noticed often during my monastic training. It is the fact that individuality, especially as influenced by novel thoughts or insights, is most fully expressed in a collective setting with a higher level of conformity at work than we normally experience. It's also an intrinsically pleasureable and satisfying social event. -The correct techniques, both physical and mental, of the Zen style of meditation; with enough personal attention from a qualified instructor that each participant will be equipped to continue to meditate on their own. -An enhanced sense of how to bring a Middle Way sensibility to everyday life. 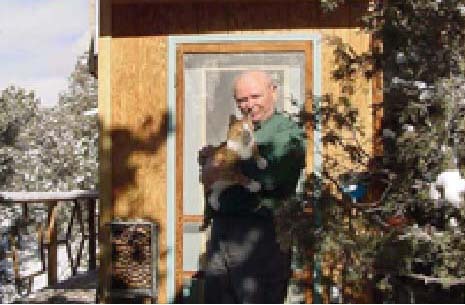 The instructor: To the left is a photo of Wayne Codling, taken outside his cabin at Crestone, Colorado. Wayne will be the leader and facilitator of these meditation/discussion sessions. He is 57 years old and has spent the previous three decades deeply immersed in Zen practice as a student of the Beginner's Mind teachings of the late Zen Master Shunryu Suzuki-roshi. Wayne's monastic training took place at the San Francisco Zen Center in California with further experience in New Mexico and Colorado. Today he lives in Victoria, teaching zazen, illustrating its usefullness in a real world setting and serving individuals who want spiritual coaching. These sessions are not about Zen or Buddhism per se, but are certainly influenced thereby.